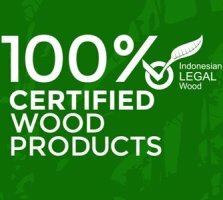 Furniture, Indonesia Furniture, Teak Garden Furniture, what’s new? While engineered teak floors are a bit more expensive when you buy, they are way more cheaper on the long term, as they reduce installation costs as the process is long way faster, and engineered teak floors also require less maintenance than ordinary hardwood teak floors. The main difference between standard teak floors and the engineered ones is that they come finished from the factory, making the whole installation proces fast, and require less labor. Being finished at the factory also means that all required treatments have been applied in a professional way. The overall look and feel of both engineered and standard teak floors is just the same. When you take into consideration that all the blocks of standard teak hardwood floors need to be treated, sanded and finished you will understand that the whole process can easily take several days depending on the area you want to cover. Sometimes you need to apply some products to achieve the right look that you are looking for, and from time to time, you will also need the help of highly trained professionals. Engineered teak floors simplify the installation process to the point that almost anyone with little experience can install the floor. People is usually confused and think that engineered teak floors are of inferior quality because they usually think of laminated floors. Laminated teak floors aren’t made of hardwood, but a composition of melamine infused paper and some teak wood chips, if you think again, laminated is very different to hardwood. Hardwood teak flooring is made of real teak wood, and repeating what we said earlier, engineered and standard are just the same but only one has been previously sanded and finished for your convenience. Something that I almost forgot to tell you is that standard teak floors also require aditional supplies, for example aditives that will help the floors to maintain it’s original look and resist daily wear and tear. However if you are on the group that enjoys the “Do It Yourself” standard teak floors are the way to go. Take your time to consult prices and then do the math. Standard teak floors are cheaper, but will require a lotof work to get prepared, and obviously a more specialized installation wich will elevate your initial costs. On the other hand, engineered teak floors are a bit more expensive when you buy the pieces, but they require less effort and knowledge to be installed, this means less time, and less money spend on the installation. We hope that this post helps you understand the difference between this two types of floors so that you can make an informed decision when buying hardwood floors.